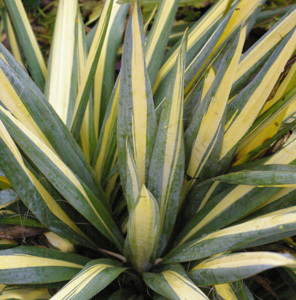 Joy Creek Photo Archive (c) all rights reserved This variegated Yucca has been a brilliant addition to our borders. The clean yellow stripe down the middle of the dark evergreen ribbon-like foliage blushes pink in the winter giving it a festive appearance. As the heat comes on, it returns to yellow. By late summer, Yucca 'Color Guard' sports a yard-high spike of cream-white flowers that steals the show. A Great Plant Picks selection. Mid- to late summer. 24 in. x 36 in.